Today we pick up our investigation into what may be contributing factors in the shark bites at La Réunion. Part 1 of the Investigation: Man vs shark La Réunion shark attacks can be found here. Calls for the slaughter of sharks are usually the first gut reaction from the population who experienced a shark panic. Such killings appear to the same extent by the desire for revenge and the idea that the killing of sharks will restore personal security. But scientists such as George Burgess from the International Shark attack File (ISAF), say in a prayer-like manner, that there is practically no chance to catch the killer shark because they do not exist. In the second half of the 20th century, the aim was to make Hawaiian waters safer by killing as many sharks as possible. Between 1959 and 1976, the authorities slaughtered 4,668 sharks (including 554 tiger sharks). But the number of attacks hardly changed. According to the ISAF in 2016, there were only four deaths due to unprovoked shark attacks. So where does this increase of attacks in Réunion come from? First of all, a periodic variation is nothing extraordinary. At regular intervals in a small geographic area, an increased number of shark attacks can occur. The reason for this can have natural causes (eg El Niño) or human. In Réunion, specific human-induced environmental disturbances or changes have been identified: the island has been on the ISAF radar for over five decades as an area with above-average human-shark encounters. During this time, the island population has doubled. Tourism has also increased in the region and the number of surfers has increased dramatically over the last 30 years. More people in the water will inevitably increase the chances of attacks. In addition, there were also noticeable changes in habitats, especially the reduction of coastal coral reefs, which have reduced the abundance and diversity of the island’s fish stocks. Since all parts of an ecosystem are inevitably linked, this also applies to sharks and their prey. In Réunion, man exerts enormous pressure on the ecosystem of the sea. Large fishing fleets as well as many small fishing boats have fished the ocean almost empty. Other sources say that the poisonous runoff from the agricultural industry has caused a fish death. This means there is little prey for predators – and they would have to look for other food sources i.e. humans. “This is an almost unique situation for a tropical island.” Benoît continues. “Of course, theoretically it could be true, that the regulation of fishing has produced a larger bull shark population. These sharks are recovering the fastest and they can become very competitive or aggressive due to the limited food sources. “I cannot confirm this personally. But we know that bull sharks are hunting mainly at river mouths – exactly where most of the attacks took place. “These are the places where the dirty waste water from the industry and hotels enters the sea. This is a huge problem especially after heavy rainfall. Despite the many attacks, I am clearly against the culling of sharks!” Benoît said. There are no diving or freediving activities on Réunion which are directly aimed at shark encounters. This means that bull sharks here almost never interact with humans. Bull sharks are usually shy, but they can be very territorial. When you see one, it tests you. It wants to see whether you are a threat or whether you are a potential competitor. If you do not stand your ground and react accordingly, one can be in danger. Therefore, most of what we call unprovoked attacks strike surfers and swimmers, because they cannot see the sharks under water and thus cannot react. “We’ve both been diving in the Bahamas,” continues Benoît with his explanation. “What impresses me there is the healthy ecosystem and the permanent presence of sharks. Many years ago, the Bahamian government decided to ban shark fishing because they realized that sharks are important to the ocean and that a dead shark is much less valuable than a living shark. 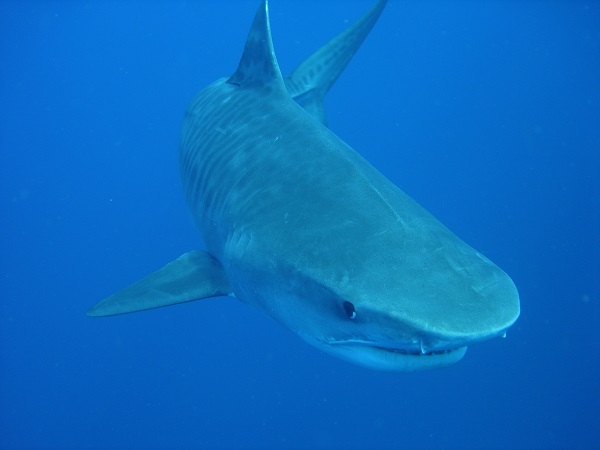 “Every day you can see various shark species, including many bull and tiger sharks, swimming around popular dive sites, beaches and in harbors around the yachts. Guided shark dives are very common and they often happen to be in the immediate vicinity of beaches. Shark tourism is big business there. But even though many people are in the water, including swimmers and divers, accidents are extremely rare.” he said. So, could the answer be a healthy ecosystem with people and sharks, who often interact together? Another question pops up – and that is why the neighboring island of Mauritius, which is just 200 km (124 mi) away, does not have shark problems? Mauritius is visited by more tourists than Réunion. The island has about 300 km (186 mi) of coastline, about 100 km (62 mi) more than Réunion. Nevertheless, the last shark attack took place over 30 years ago. All concerns about sharks raised by tourists in Mauritius are inevitably answered by the following statement: The coral reef is protecting these waters. However, the coral reef is only a hypocritical explanation, not to scare away wealthy guests from the luxury resorts. Fishermen, scientists, government officials and most others know that sharks can easily cross the coral ring. In addition, many of the water sports activities take place on or beyond the coral reef. But if the response of a protective coral reef is wrong, what can explain why Réunion has become one of the most active shark attack zones in the world, while Mauritius continues to have safe waters? The truth involves a complex set of factors, including underwater geography, industrial drainage, a reduction in fish stocks, and the fact that hunting for sharks in Mauritius and the sale of meat and fins continue to be legal. On the one hand, the geologically younger, volcanic island of Reunion rises out of the deep ocean much more steeply than Mauritius. At the same time, the steepness of the shores allows sharks that come up from the deep – like tiger sharks – to approach the coastal zone more easily. “On Mauritius, surfers tend to be active on sandy beaches, while the big waves in Reunion break over corals – a place where sharks are more likely to be looking for food” explains Benoît. 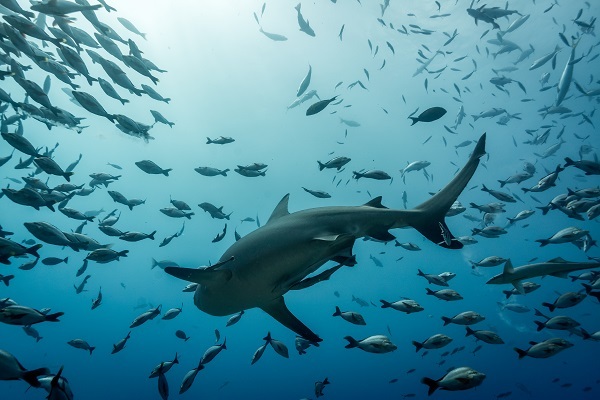 Surfers and scuba divers are known globally to check weather and swell reports before heading out, yet are generally still not logging on to reports of shark activity. Nobody wants to tell someone they can’t go out surfing, bodyboarding, diving or swimming because they might get bitten. But in the end it is the individual’s responsibility to protect themselves as much as possible — not government’s. Perhaps it is time for the French authorities to stop spending the taxpayer’s money on a slaughter program that costs a fortune and does not show a significant reduction in the number of accidents? Why not instead invest some of the money to help local dive sites to promote shark dive activities? Until now, everything else has failed. The solution will take a long time, but it could be a first step for a co-existing of people and sharks. Please stop lying or take contact with people who works really on the Shark Crisis in Réunion Island… this kind of articles are a part of the problem, because of international pressure based on wrongs facts and simplistic explanations, people died and all the Island is suffering. Thank you for your comment. I believe the heart of the article is that not enough is known about the shark population around the islands. Without that information, it is tough to figure out how to coexist with the sharks. If you have contacts with officials involved with the Shark Crisis, we would love to speak with them. Thank you again for the comment and for pointing out the error on the photo. I have corrected.